I originally saw this recipe over at the Pioneer Woman’s site and was immediately intrigued because I just so happened to have zucchini in my fridge. Rarely do I post recipes when I make them from her site because she has such a large following and provides step by step instructions with great photos. I figure what can I possibly offer to my readers that she hasn’t already, ya know what I mean? However, this recipe is actually from her new recipe site Tasty Kitchen and it’s so good, it needs some more blog love! I was kind of taken aback when I realized this only called for three tablespoons of oil, but I figured the zucchini and pineapple would provide a lot of moisture, so I just rolled with it! If I want to get technical, this recipe is a little healthy. Yeah, I know it has sugar, but only a minimal amount of fat, plus is has fruit and vegetables! This did take a little longer to bake than indicated in the recipe instructions, but I just kept a close eye on it and it worked out just fine. The cream cheese frosting really pushes this cake over the edge and into the realm of bliss, but I do love me some cream cheese frosting, so the feeling of bliss is probably quite subjective! Oh, I also want to say congratulations to Lindsay of the blog, La Belle Vie for winning my blogoversary giveaway! Lindsay, I hope you enjoy all the baking goods as much as I do! 2 cups powdered sugar, approx. 2. To prepare cake, lightly spoon flour into dry measuring cups; level with a knife. combine flour, sugar, coconut, baking soda, salt, and spices in a large bowl; stir well with a whisk. 3. Combine oil, eggs, and vanilla; stir well. stir egg mixture, grated zucchini, and pineapple into flour mixture. batter will be stiff and dry but keep folding it and it will all come together. If it still seems too dry, just add a little splash of the pineapple juice. 4. Spoon batter into a 13 x 9-inch baking pan coated with cooking spray. bake at 350° for about 33-35 minutes or until a wooden pick inserted in the center comes out with moist crumbs and cake is pulling away from sides of pan. cool completely on a wire rack. 5. To prepare frosting, combine butter and cream cheese in a large bowl. beat with a mixer at medium speed until smooth. beat in powdered sugar and vanilla just until smooth. add a splash of milk or pineapple juice if necessary. spread frosting over top of cake. You can garnish with chopped pecans or walnuts, if desired. - If your zucchini are huge, scrape the seeds out of the center before you shred it so it’s not too watery. - Also, I spread it all out on layers of paper towel to drain it and dry it off a bit. Then I measure out 2 cups. Not sure if this is critical though. - Nuts can also be added to the cake batter if desired. - This recipe makes a very generous amount of frosting. 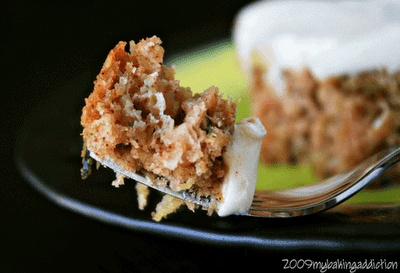 - Recipe can be turned into a carrot cake just by substituting shredded carrots for the zucchini. Mmmm, sounds delicious! I think I'll throw in a handful of walnuts too. Yum! Thanks again! And trust me I will loooove everything!!! This is on my list for certain. I love the pineaple in there and with this frosting, oh my lord. Delicious! Yum! 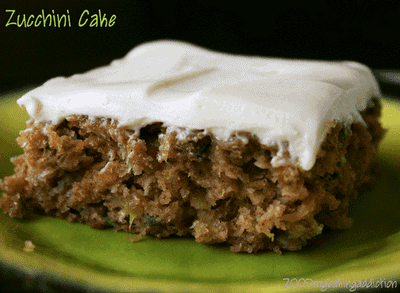 This looks like a great alternative to my usual zucchini bread/cake. Love the frosting! Must taste super together. Yummy! great pictures. I could just take a bite right off that fork. Looks and sounds fantastic! Even better with only 3tbs of oil. ohh this does look good. I made a zucchini and whole wheat flour bread a while back and it was sooo nasty I threw it right in the trash! This looks incredible, I love the cream cheese frosting! I love the cream cheese frosting. And pineapple+zucchini sounds delicious. Looks great looking for new recipes as I found a 5lb zucchinni in my garden after being gone for 10 days. you can also shred the zucchinni and freeze for a later date!! I remember seeing this on PW! Loved it then, love it now! Sounds like you had loved it too! 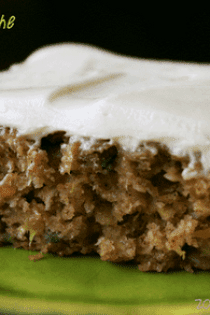 I just made zucchini bread and have about 8 left to use…this might be my next attempt! An interesting combo but a geat one. I am about to bake now. I am not sure I will have time but if I do, I want to add this. This looks fantastic. And sorta healthy…well, until you get to the cream cheese! :) Thanks for posting it. I'm catching up on your blog…as usual, everything looks fantastic! This looks awesome, and possibly low fat? I will def. make this next week! I am so glad it worked for you!!! Enjoy! Those additions sound delicious! Thank you so much for stopping in to let us know that you enjoyed the recipe. Have a wonderful day and thank you for following MBA!